Fresh Beautiful Greens | Faddegon's Nursery, Inc.
Wreaths, Trees, Swags, Garlands, Kissing Balls & Boughs. 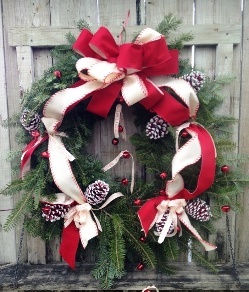 We hand decorate every one of our fresh balsam wreaths with amazing ribbons, cones and bells! You’re sure to find just what you want to create a Holiday memory for you and yours.